As if the holiday season wasn’t daunting enough, it seems that every special occasion revolves around a feast. I mean, it’s festive and communal and I totally get it, but even a seasoned foodie can be overwhelmed by the sheer volume of significant meals that take place in the month of December. Just as the latke parties are winding down, it’s time to gear up for Christmas Eve, Christmas morning, Christmas dinner, New Year’s Eve, New Year’s day…the chow-fests come fast and furious. As those of you still eating turkey sandwiches know, these food-centric festivities require inventive leftover applications. But for holidays like Christmas and New Years, when back-to-back banquets are in order, leftovers (typically an unintentional afterthought) can become part of the game plan. Turn last night’s mashed potatoes into breakfast croquettes or a vegetable side dish into an omelet filling. My favorite 2-for-1 recipe is a simple bread dough that makes fresh-from-the-oven rolls for tonight’s supper and sweet sticky buns for tomorrow’s breakfast. Adapted from a recipe by Mindy Fox, published in the November 2007 issue of Everyday with Rachael Ray Magazine. Combine 5 cups flour, sugar, yeast and salt in the bowl of a standing mixer. Using the paddle attachment, gradually mix in the softened butter (not the melted butter) on low speed until combined. With the machine running on low, mix-in 1 egg, then add the lukewarm water in a slow stream. Increase the speed to medium and beat for 2 minutes. Mix in 1 cup flour on low speed, then increase the speed to medium and mix until a ball forms, about 1 minute. Attach the dough hook to the mixer and knead the dough for 10 minutes, until smooth and elastic. Shape into a ball, transfer to a greased bowl, cover and let rise until doubled in size, about 45 minutes. Punch down the dough, re-cover and rest for 15 minutes. Preheat oven to 350°. Brush the bottom and sides of two 9-inch round cake pans with some of the melted butter. On a lightly floured work surface, roll out the dough into a 14-by-16-inch sheet. Using a 2 1/2-inch round cookie cutter, cut out 40 rounds, gathering the scraps re-rolling as necessary. Dip 20 dough rounds into the remaining melted butter. Fold rounds in half and line up in the pan, seam side down. Cover and let rise until doubled in size, about 30 minutes. Repeat with the remaining 20 dough rounds in the second cake pan, cover with plastic wrap and refrigerate for the Sticky Buns. Beat the remaining egg with 1 teaspoon of water. Brush the risen dough with the egg wash and sprinkle with the coarse salt. 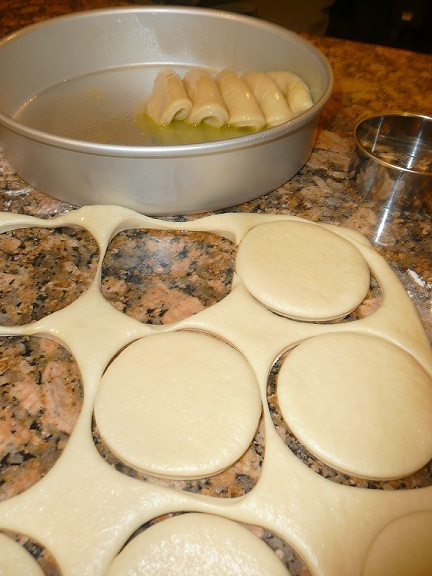 Bake until the rolls are browned and a toothpick inserted into the center comes out clean, about 30 minutes. Preheat oven to 350°. Remove the prepared rolls from the fridge and let stand at room temperature for 1 hour. 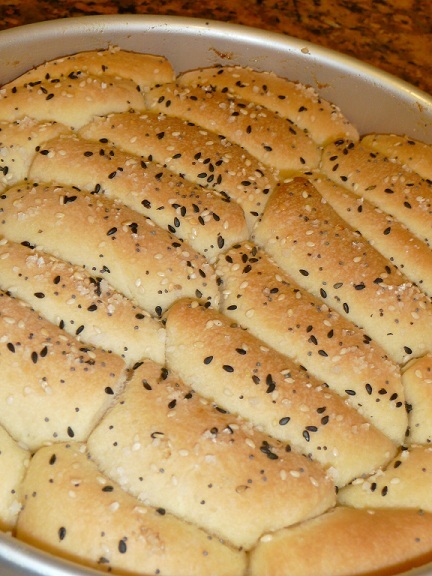 Bake the rolls until golden and a toothpick inserted in the center comes out clean, about 30 minutes. Let cool on a rack for 5 minutes and invert onto a plate to unmold. Flip onto a serving platter, rounded side up. Whisk together the confectioners’ sugar, lemon juice, ginger and salt. Drizzle the glaze over the rolls and sprinkle with the chopped nuts and candied ginger.